Uzbek food is similar to that of the rest of Central Asia. During the summer and autumn, there is a wide variety of fruit: grapes, pomegranates, apricots (which are also dried and sold at other times of the year) and, dwarfing them all, mountains of honeydew and watermelons which you will see in huge piles at markets and on roadsides. Unlike other Asian cuisines, Uzbek food is not spicy and tends to be quite bland. Uzbeks pride themselves on the quality and variety of their bread, which is disk-like in shape and quite hard, and is often decorated with patterns and sometimes colours too. In general, hotel food shows a strong Russian influence, soups, cold cuts, cheeses, yogurt and meat is generally served, and unless sweet, nearly all plates will be liberally sprinkled with dill. There are a number of restaurants that serve both European and Korean food. Beer, wine, vodka, brandy and are all widely available in restaurants. • Plov (dozens of variations of this dish but usually consists of chunks of mutton, shredded red and yellow carrot and rice fried in a cast iron or aluminium pot. Staple food for both every day and celebrations). • Shashlyk (skewered chunks of mutton barbecued over charcoal, served with sliced raw onions). • Lipioshka (rounds of unleavened bread). Served in restaurants and often sold on street corners, to make an appetising meal. • Samsa (samosas) are also sold in the street, but the quality is variable. • Manty (large boiled dumplings stuffed with meat). Uzbekistan, while Muslim, has kept hold of many its Soviet habits, including a love of alcohol. 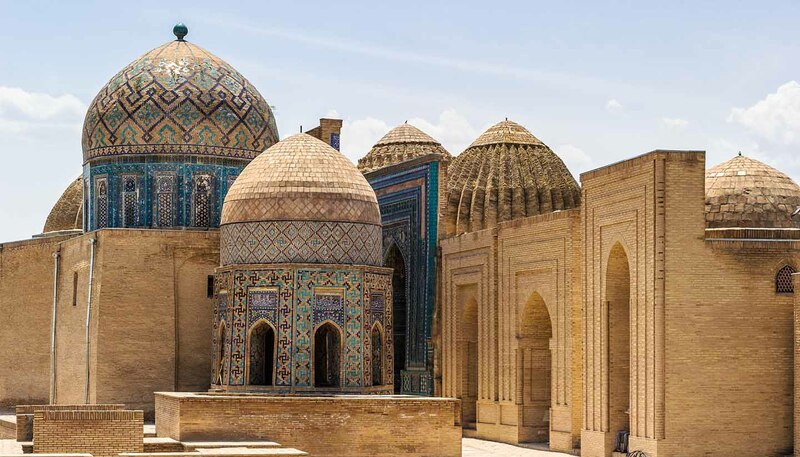 A small wine scene has started up as a result and now Uzbekistan has 14 wineries, the oldest and most famous being the Khovrenko Winery in Samarkand. It is usual to tip 5 to 10% in restaurants, bars and nightclubs. Restaurants in international hotels usually include service in the bill. Tea is the staple drink of Central Asia, and chai-khanas (tea houses) can be found almost everywhere in Uzbekistan, full of old men chatting the afternoon away with a pot of tea in the shade. • Kefir (thick drinking yoghurt, is often served with breakfast).